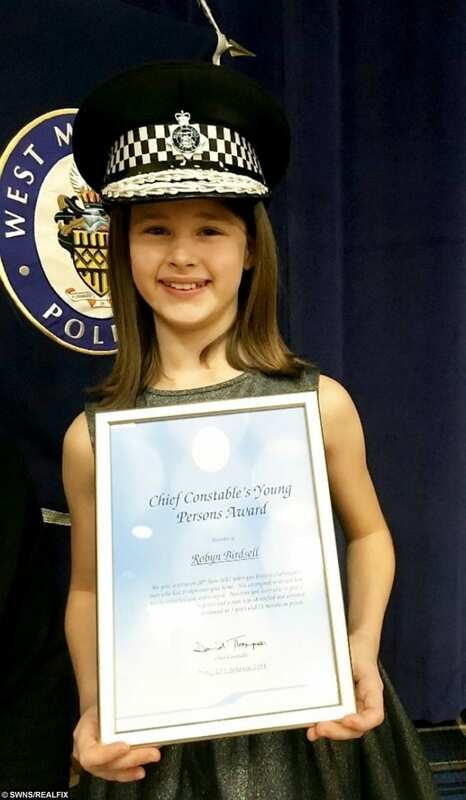 A 10-year-old schoolgirl who chased a burglar out of her home after finding him ransacking her family’s belongings has been given a national bravery award. Shockingly, the thug twisted the youngster’s arm and pinned her against a wall before he fled from the property in Sutton Coldfield, West Mids. But thanks to Robyn’s detailed description of the offender, officers were able to track the 31-year-old down and he was later convicted and jailed for four years. She has now been given a commendation at the Police Public Bravery Awards for her heroic actions during the raid on June 20 last year. Robyn had been returning from a swimming lesson with her mum Rachel when she saw the intruder loading up her rucksack with valuables. Without thinking she chased him into the back garden and tried to pull him backwards as he clambered over the fence. “He kept on running and dropped a few things. 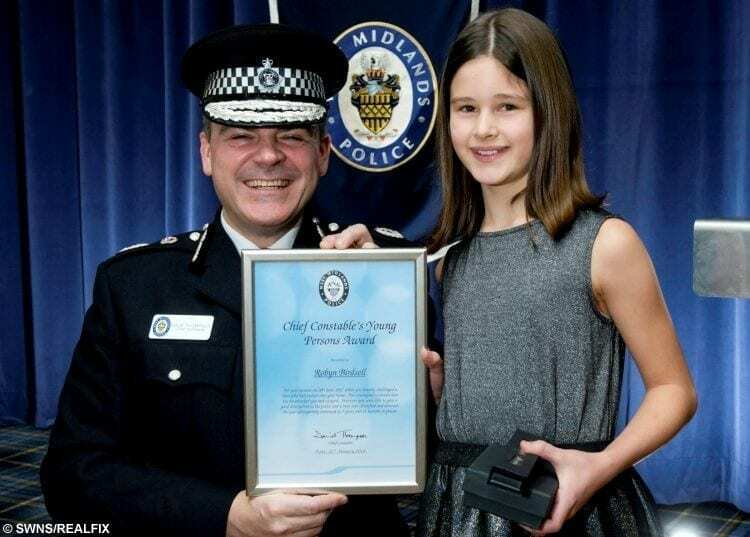 The pupil from Town Junior School, in Sutton Coldfield, received the award and cheque for £181 from Birmingham Police Commander, Chief Superintendent Kenny Bell. Robyn also got the chance to check on the progress of puppy Robyn, now approaching her first birthday, who she selected from a litter born in January to take on her name. She added: “Robyn was only three weeks old when I last saw her. I remember she came straight over to me and looked very comfortable snuggling on my lap which was why I decided to pick her. “She’s grown up so quickly, not quite as cute and cuddly as she was as a little puppy but still adorable. 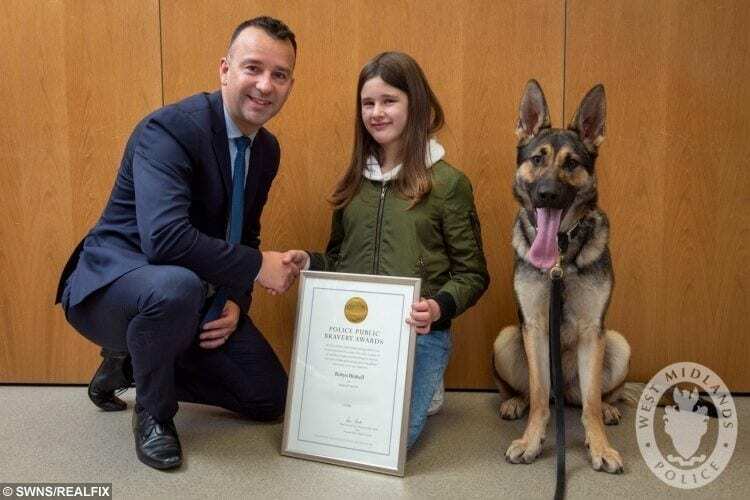 Dave Raymond, West Midlands Police’s Breed Scheme Manager, said: “Robyn (the dog) has done well and has the potential to be a good police dog… she’s very good natured but can certainly put on a fearsome bark when she needs to. “Around 90 per cent of the dogs we train are successes and go on to become operational police dogs. Chief Constable Dave Thomson said previously: “Robyn’s fantastic. She is a brilliant ambassador for what we want the public to do, sort of. 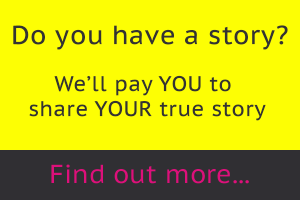 West Midlands Police and Crime Commissioner David Jamieson, added: “What an incredible tale of bravery.